It's often the case your DVDs get scratched due to a variety of reasons, which leads to DVD playback failure. Luckily, such problem will be eradicated in the post. Just follow the tips below and learn how to fix a scratched DVD, slightly or severely. 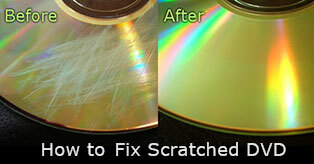 If you are still hanging on to a DVD collection, you might find your DVDs are inevitably getting scratched sometimes. For example, your kids damaged DVD discs innocently, years-old DVDs worn out owing to dust, etc. (Check awesome DVD storage ideas to aviod DVD scratches). The good news is that minor scrapes are easy to fix, whereas repairing seriously damaged DVDs can be troublesome. So if your DVDs get scratched, getting a general knowledge of the DVD damage degree is a must before you fix scratched DVD. Generally, DVDs getting scratched, sightly or severely, will lead to different situations. MacX DVD Ripper Pro is able to remove scratches from DVD and play the DVD movie on Mac, Windows, iPhone, iPad by copying and ripping slightly scratched DVD to MP4, MOV and more with ease. • The DVD video gets stuck at at a frame etc. In generally, if these situations emerge, you can find your DVD disc is in small surface damages or dirty marks. Some unusual home remedies at hand, like banana, toothpaste, furniture polish and baking soda can be used to remove scratches from DVD. Also, some DVD ripper for Mac/PC tools can handle these issues well. Likewise, there must be some deep or circular scrapes, around the laser track when you encounter such problems above. Unfortunately, you cannot fix damaged DVD to solve DVD won't play problem with the home remedies. Some CD/DVD data recovery software might work, but no guarantee. In fact, since DVD and Blu-ray can be easily damaged. So don't wait until your cherished physical movie library gets broken. The best way to preserve DVD is to back up DVD in advance to prevent any hurt to discs. To do this, a terrific DVD copy software, MacX DVD Ripper Pro is highly suggested. It allows users to digitize DVD collection, and rip DVD to MP4, MKV, AVI, WMV, MOV, etc at fast ripping speed without quality loss. And it also makes 1:1 copies of DVDs for backup regardless of any DVD protections such as Sony ARccOS, Disney X-project protection, region code, CSS, etc. 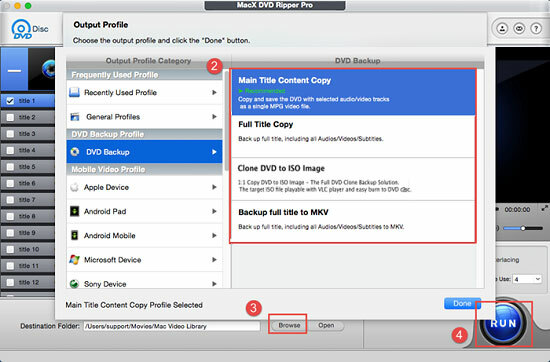 Free download and launch MacX DVD Ripper Pro > Click "+" icon to import DVD disc > Choose the output format from "DVD backup" item > Start copying DVD by hitting "RUN" button. You can cope with the slightly scratched DVD using this tool. Sometimes, you are informed of DVD bad sector error when playing the DVD movie. This is because of the copy protection encoded on the physical disc, most known for the DVD from Sony, to prevent DVD player from accessing to it. But you can also make full use of this DVD copy software to bypass those damaged errors. To fix a DVD disc and get it playable again, you need some solutions to fill in the small surface scrapes. A store bought scratch-filler will definitely do the job, but you can also turn to daily things to do the same thing. Now let's check the ultimate things available to remove scratches from DVD. 1. Furniture polish & Jewelry Polishing Cloth. It is wide known to fix scratched DVD. You will be surprised how well a can of Pledge can shine up an old DVD as you use a jewelry polish soft cloth and some wax furniture polish to clean the disc with a motion from the center to the outer. 2. Heat. If you're committed to watching your damaged DVD, then you can try slightly heating the disc. Since the Polycarbonate, the main material of DVD, has a very low melting point, and becomes very malleable with only a bit of warmth. So you can just hold the disc through the ring in the middle up to the bulb, it will correct any minor scratches in the imprinted data and make the disc easier to read. 3. Banana. Actually, it has been exaggerated on DVD scratch repair. You will rest satisfied with the function of cleaning the DVD instead of fixing scratched DVDs. Anyway, it can be used to fix DVD scratches with dusts and dirty marks. 4. Baking Soda & Toothpaste. It does work on removing scratches from DVD, but not for the badly scratched DVD discs. When you place a dab of toothpaste or baking soda on the rub the paste into the scratch from the center of the DVD outward, you are essentially "sanding" down the imperfection on the surface of the polycarbonate plastic layer. To refrain from all these troubles, backup your DVD with free DVD copy software. • Repair discs for: PlayStation 1 and 2; XBOX / XBOX 360, and the Nintendo Wii. • Repair up to 25 discs using a patented FlexiWheel, and resurfacing fluid to smooth the surface of damaged discs. Rip scratched DVD to MP4, MOV, MKV, etc for playing flawlessly on computer and mobile.